Covers for the Pamphlet Series, 2003-2010. 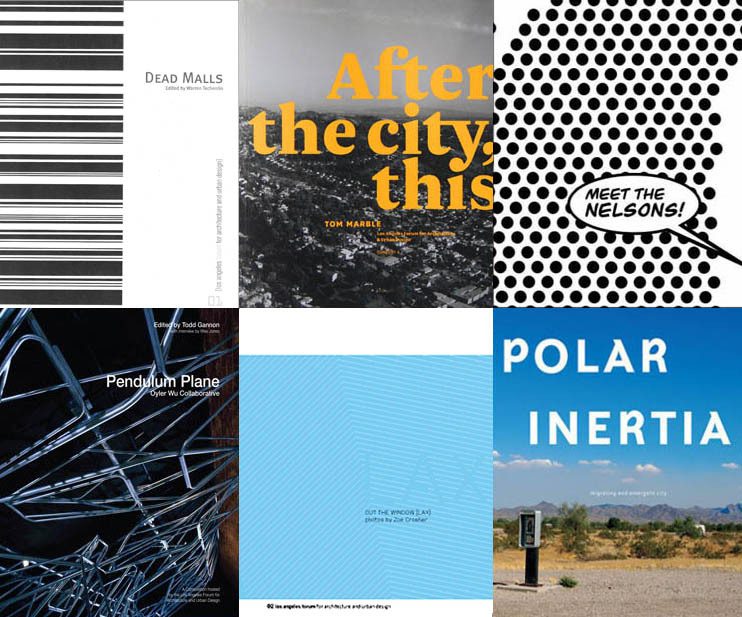 The Pamphlet Series project was made possible with support and funding from the Los Angeles Forum for Architecture and Urban Design, The National Endowment for the Arts, and the City of Los Angeles, Department of Cultural Affairs. The Pamphlet Series is available from R.A.M. Publishers. In January of 1988, the Forum began to publish Forum Newsletter for its members and distributed to over 2,000 interested readers. The Newsletter reports on the activities of the Forum and includes commentary, criticism and members’ concerns. For its first four years, writer, planner, architect Natalie Shivers served as Newsletter Editor. During most of 1992 and 1993, Architectural Historian Sylvia Lavin edited the Newsletter and oversaw a major re-design executed by Whitney Lowe of ReVerb. In 1994, architect Chava Danielson assumed editorial responsibilities with Joe Day as her co-editor. In 1998/99, the newsletter was edited by Barbara Bestor. Jack Burnett-Stuart and Rachel Allen brought the newsletter to the web. After three years on the web, the newsletter was redesigned and renamed Forum Issues, whose editors included Alan A Loomis. Additional online articles focusing on topics and projects outside the bounds of specific Forum Issues were distributed as ‘Online Features’ .Forum Issues ran through the mid-Aughts, when the Forum shifted it’s focus back to publishing, with the Pamphlet Series. Selections from Forum Issues in 2004 were collected for the publication Forum Annual 2004. 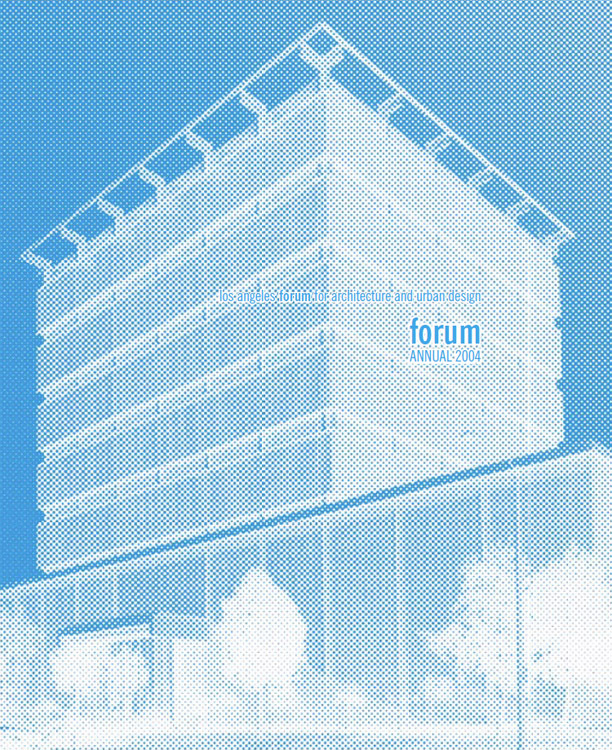 Cover of Forum Annual, 2004. An occasional series, the LA Forum Portfolios are limited edition prints by contemporary artists. Each portfolio is curated by an LA Forum board member, who solicits the generosity of local artists asking them to contribute a two-dimensional work. By engaging in the local art community, the LA Forum takes a step back to view architecture from a conceptual and visual perspective. The resulting prints provide a varied look at Los Angeles’ design practices and urban landscape. Excerpts from the Forum Portfolios. Before moving information distribution primarily online, the Forum would occasionally issue the ForuMemo, a mailer series initiated by board member Tom Marble in 2002. In addition to news and information, the ForuMemos featured an original work by a local artists, which would then be available in a following Portfolio. The original collection of ForuMemos became the first Forum Portfolio, Art + Architecture, in 2003. Each Portfolio is a limited small edition. All proceeds go directly to LA Forum programming, which provides lectures, discussions, tours, catalogues and events open to any with an interest in design or architecture. Prior to the Pamphlet Series, the Forum’s publications included small essays, pamphlets, photographic series and books. Forum publications allow topical investigations and adventurous experimentation in keeping with the Forum’s overall mission. Previous Forum publications includedSwimming to Suburbia, Los Angeles Boulevard: Eight X-Rays of the Body Public, Experimental Architecture in Los Angeles, Everyday Urbanism andWrapper, as well as the previously mentioned Forum Newsletters, Forum Issues and the Forum Annual. Covers of earlier LA Forum publications. A book of Mudford’s black and white photographs of the every-day architecture of several American cities, including Los Angeles. Designed and handbound by architect Gary Paige. A small essay describing the relationship between theme parks and modern American urbanism. A series of a dozen black-and-white photographs by COA “created through the super-imposition of found urban artifacts pulled from their functional context and treated as fragment and empty sign” with accompanying text. Addresses architecture as information and takes the form of a HyperCard Stack for the Macintosh computer. Includes a computer diskette with all required software, duly licensed for personal use. Also included are 40 printed 4 1/2″ x 7″ cards that display the majority of the screen images that appear in the stack. ARCHINFO has sections on information, on paradigms, on Hypertext, unpredictability, and analysis of Los Angeles based on these concepts. Taking advantage of the non-linear and interactive forms of Hypertext, the primary text also includes comments by Aaraon Betsky, Christian Hubert, and Sanford Kwinter. This book was published by Rizzoli International and features the work of 22 architecture firms presented during the Forum’s “Out There Doing It” lecture series. It was designed by Lorraine Wild of Cal Arts and the design firm ReVerb. Accompanied by a reproductions of a painting series on Los Angeles, “Skycam,” by artist Peter Alexander and designed by Christopher Vice, Cenzatti introduces the work of a group of urban theorists known as the “Los Angeles School,” a school of thought known for its analysis of Los Angeles’s economic characteristics and spatial development. Photographs by Benny Chan, designed by architects/graphic designers Nicholas Lowe and Sheridan Lowrey. Case studies documenting the privitization of what was once public space though methods such as street barricades, fortification, security systems, etc. This book contains essays and visual images which serve as a tool for understanding the “as-found” character of our cities. “Everyday Urbanism” is based on the daily experience of the city – trips to supermarkets, the commute to work, the journey along the strip passing by the mini-mall, the carwash, and the franchise food emporium. This book features a collection of drawings for the redesign of the facade of the Museum of Jurassic (William Stout, 2000). This book features a collection of drawings for the redesign of the facade of the Museum of Jurassic Technology in Los Angeles.